In winter, this deciduous shrub has clusters of sweetly scented, sulphur-yellow flowers clinging to bare twigs. In autumn, the bright green leaves turn specta cular shades of yellow, orange and red. 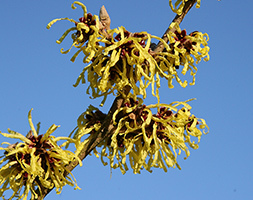 The tiered branches of this award-winni ng variety of witch hazel contrast well with the vertical stems of dogwood. It is a lovely specimen plant for a sunny winter border or woodland edge, where it s fragrance can be appreciated. The flowering twigs can be cut to perfume rooms in winter.